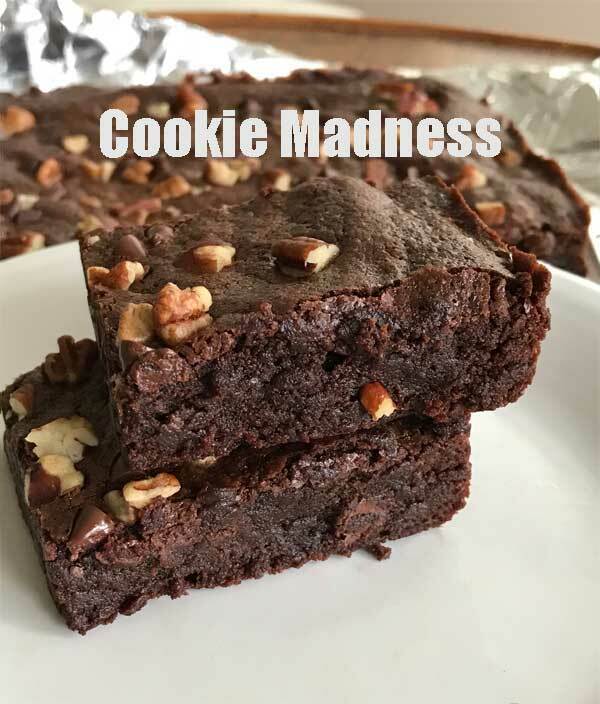 This recipe is based on an old one called Jenny’s Brownies, however since posting I’ve changed it up quite a bit. This is the new and improved version of basic cocoa powder brownies. They have a fairly generous amount of cocoa powder, but they aren’t overly rich or sweet. They also have a fudge-y texture, but not overly so. Very basic yet extremely tasty cocoa powder brownies. Preheat oven to 325 degrees F. Grease an 8 inch square metal pan or line with foil and grease bottom. Mix together flour, cocoa and salt; set aside. In a mixing bowl, whisk together sugar, melted butter and oil, then whisk in the eggs, one by one. Whisk in the vanilla. With a spoon or scraper, stir in the flour mixture and beat about 50 strokes. Spread batter in pan and bake for 30 minutes at 325 degrees F.
Anna, I put in 3/8 tsp of salt and they definitely didn’t taste as flat. Thanks for the heads up on adding salt. Thanks for the salt info. I’ll try these again after I go to the store for more butter. How could I be out?! DOH! The rule of thumb I follow is for every recipe that calls for “butter or margarine” use an extra 1/4 to 3/8 teaspoon of salt. If an ingredient list doesn’t call for any other salt, I go with 3/8 teaspoon. If the recipe calls for butter or margarine and has a little salt (such as this one), then I add an extra 1/4 teaspoon. In this case the recipe just called for “butter” so I wasn’t entirely sure whether the used salted or unsalted. I had a hunch it was salted, but I was still fairly conservative and just used an extra 1/8 teaspoon to make a total of 1/4 teaspoon. However, the brownies would probably have been fine with up to 3/8 teaspoon total. Since you noticed the flatness of the salt-free brownies, you probably appreciate salt and should use a full 3/8. I might make my next batch with 3/8 just for kicks. I don’t think they’d be too salty. You are a good detective! 😀 That’s exactly what happened. So, I want to try this again with unsalted butter (since that’s what I have). How much extra salt do you supposed I should try? Did you use unsalted butter and keep the salt amount the same? I noticed the original recipe said butter and I think people in other countries might use salted by default — not sure, just a hunch. So I used unsalted and increased the salt. If you used unsalted butter and didn’t adjust the salt, the brownies would taste flat. You were right about the unsweetened cocoa. I think the addition of the vanilla helped, but the brownies shouldn’t have tasted flat without it. I’m thinking it was a salt issue. Hmmmm, wish I would have seen your changes before making these this afternoon. They sure were easy to whip up, which was nice. I ran out of white sugar so used 1/2 white and 1/2 light brown. I don’t think that affected the end result all that much. I felt like mine tasted a bit flat. I think adding some vanilla could have helped. I do like the consistency of them. Did you use sweetened or unsweetened cocoa? I wasn’t sure what to use so used unsweetened since there was a whole cup of sugar in the recipe. It sounds like a MUST try brownie recipe! Those sound really good! My problem is that I would eat the whole thing! Maybe I could freeze individual pieces?? Hmm.. it’s sunny out here, in IL, but frightfully cold. The perfect morning for a brownie and a glass of milk! With a description like that, how could you not try these brownies?! Thanks for sharing! It’s getting dark in the evening here. These brownies must be yum, & are quite similar to what I make. Only difference is that I use 1 tsp of baking powder, 1/2 a cup of cocoa & 2/3 cups of sugar. I also add walnuts, & sometimes give mine a mocha or cinnamon twist.Also just bake mine for 18 minutes…but they are so good!! Me too, Carol. I have a lot of chores to do and need something quick and easy. It is also dark and dreary in Cleveland. Since I am stuck in the house I am looking for something to bake. This may be it.